George Gipp played at the University of Notre Dame (1917–20) and became a school legend. Gipp entered Notre Dame on a baseball scholarship, but he was recruited for football by the coach Knute Rockne, who saw Gipp drop-kicking and passing a football on a field adjacent to the practice field. Gipp played 32 consecutive games for Notre Dame and scored 83 touchdowns. In one 1917 game he was apparently going to punt but instead drop-kicked a 62-yard field goal. 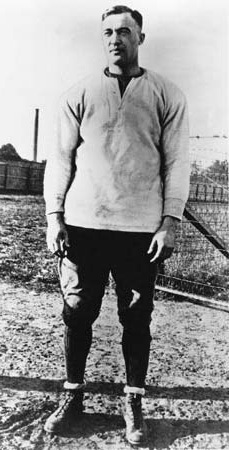 Gipp was named captain of the team for 1920, but he was expelled from the university for missing too many classes and frequenting off-limits establishments. He was an assistant to Rockne before being reinstated as a student. In his last season he enjoyed one of his greatest performances, gaining a total of 324 yards and leading Notre Dame, down 14–7 at halftime, to a 27–17 victory over Army. Later that season he fell ill and eventually developed the pneumonia from which he died. Two weeks prior to his death, he became Notre Dame’s first All-American. At halftime during a scoreless game with Army in 1928, Rockne asked the team to “win one for the Gipper,” keeping a promise that he said he had made to Gipp on his deathbed. It is unlikely that Gipp ever made such a request, but the story reinforced the Gipp legend. (Notre Dame rallied to beat Army 12–6 that year.) The legend was further burnished when Ronald Reagan (the future U.S. president) played the role of Gipp in the film Knute Rockne—All American (1940). Arda C. Bowser was one of the pioneers of professional football. He was a member of the 1922 Canton Bulldogs — the National Football League’s first championship team. Bowser, a left-footed punter, kicker, linebacker and fullback, went kick for kick in exhibitions with the legendary Jim Thorpe. He was the first NFL player to use tees — his were made from mud — and a reinforced-toe kicking shoe. A longtime general insurance agent in Chicago, Bowser retired in 1948 and moved to the shores of Lake Fredrica in Orlando. There, he tended orange groves and played golf whenever possible. Bowser died at the age of 97 in 1996. In 1922, Arda Bowser made $250 a game. Bowser played only four years in the pros because his full-time employer, White Motor Co., made him quit. 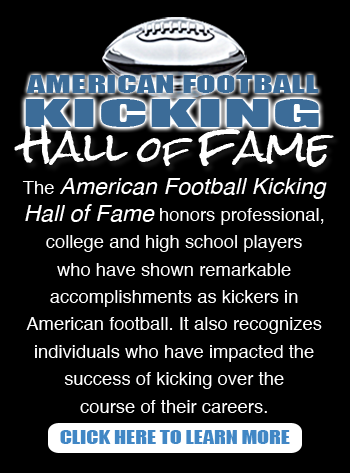 He was an All-American player in college and a member of the Bucknell University Football Hall of Fame. Historians of the game say Bowser’s mud tees that he first used at Bucknell led to today’s kicking tee. ”We had the freshmen carry a washtub of mud on the sidelines, and when I needed some for a place kick, I ran over and got a fistful of it to make a tee,” Bowser said. The 1922 Canton Bulldogs won the first NFL championship with a 10-0-2 record. Bowser scored two touchdowns and returned a kickoff 90 yards to lead a 38-0 rout of the Louisville Brecks. Bowser had replaced Thorpe on the Canton team after Thorpe left to form the Oorang Indians of Marion, Ohio. Bowser said he once played four pro football games in four days.